In recent times, there's been a lot said and written about the supposed revitalization of Downtown LA. 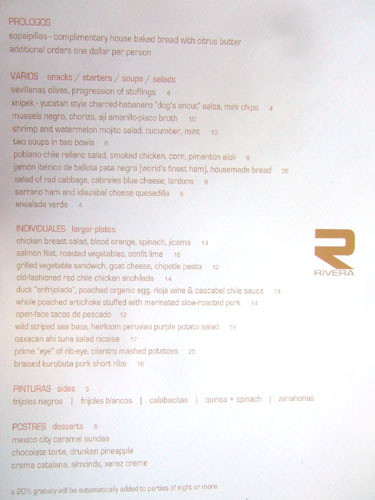 I'm not sure if I buy that line entirely, but certainly, a number of new, exciting restaurants have burst onto the DTLA dining scene in the past year, Rivera being a prime example. 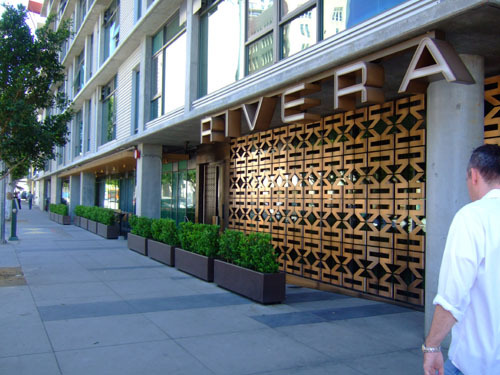 Rivera is the brainchild of Santa Fe-born chef John Rivera Sedlar, the man behind Saint Estephe in Manhattan Beach, Bikini in Los Angeles, and Abiquiu in Santa Monica. 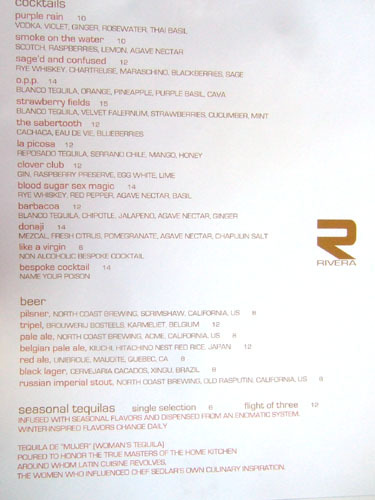 Sedlar was absent from the LA culinary landscape for over a decade (travelling the Latin world) before coming back in a big way with Rivera, his temple of pan-Latin fusion cuisine. I'd been curious about the restaurant for a while, and the place had been a fixture on my "to-eat" list. I wanted to go for dinner, but since I happen to be in the area during mid-day, I decided to stop in for lunch. The restaurant is located on the ground floor of the new Met Lofts building. Valet parking is available for $5 with validation; going south on Flower, turn left just before the loft building--I missed it my first time around. 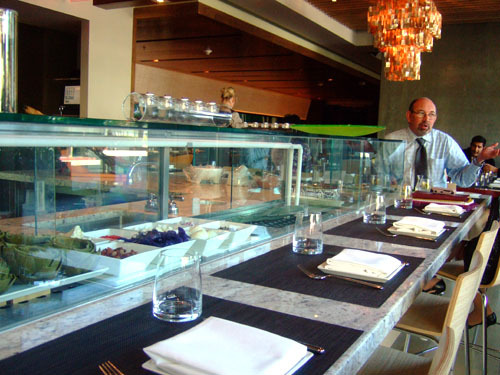 ...The rest of the restaurant being a large communal table and the ceviche bar pictured above. 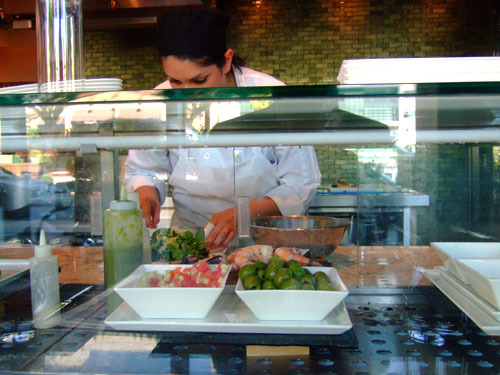 This was where I was seated, and the vantage point does provide a bit of a show in the form of the watching the garde manger prepare Rivera's cold dishes. 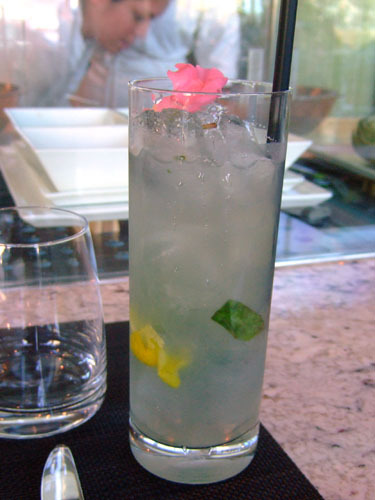 ...Purple Rain [$10], a concoction of Vodka, Violet, Ginger, Rosewater, and Thai Basil. The end result was definitely unique. The violet gave the drink a slightly floral tinge initially, but this was followed up by a strong showing from the basil and ginger. The two elements gave the cocktail a sharp spiciness, a lingering heat, and produced an almost tingling sensation in my mouth. 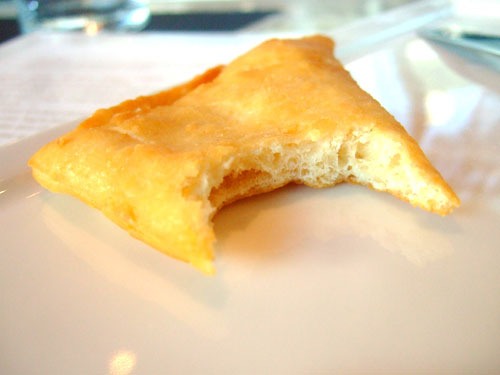 A type of Latin American fried pastry, sopaipillas are Rivera's version of bread. Served with citrus butter, they had a sweet flavor that was countered by a very sharp peppery, citric tang from the butter. I kept thinking of cornbread, and wasn't a huge fan. However, if, unlike me, you do enjoy these, do temper your appetite, as additional orders are $1 per person! 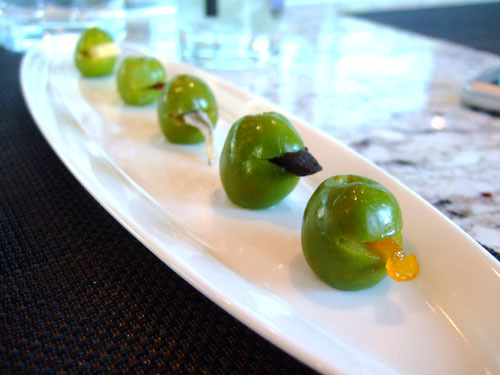 Sevillanos, or Queen, olives are a type of green, low-oil, brine-cured olive. They actually had a very mild flavor compared to most varieties, thus allowing the various accompaniments to shine. 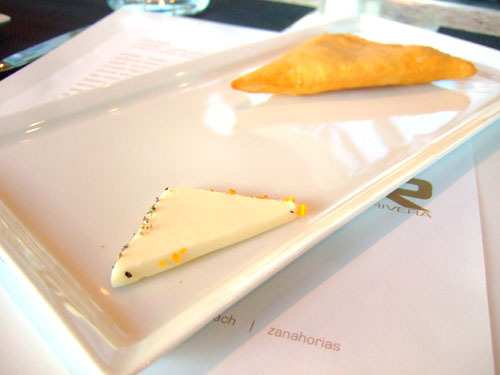 From front to back, we had orange zest, black bean, anchovy, jamon, and cheese. It was interesting to compare the interplay between the various stuffings and the olives; my favorite combination was probably the orange, with the sourness of the zest countering the bitterness of the olive. The sauce here made from a base of aji amarillo, or yellow Peruvian hot pepper; despite the name, it wasn't very spicy, but rather quite fruity. 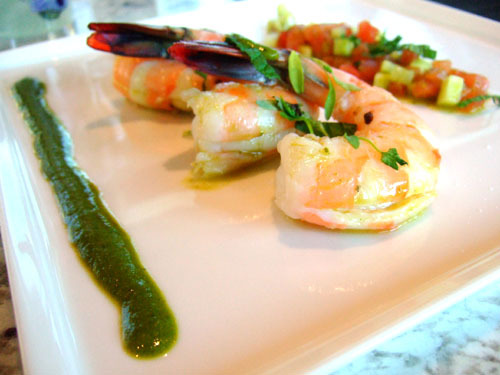 The sauce's other component was Pisco, a type of South American liquor distilled from grapes (think Brandy), which added weight and depth to the mixture. Meanwhile, pieces of chorizo contributed an unctuous saltiness to the whole ordeal. 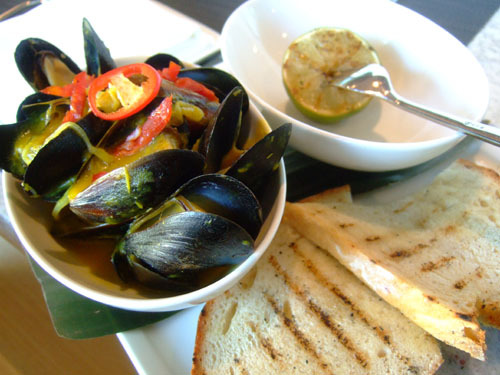 These elements did an admirable job of tempering the briny flavor of the mussels, but unfortunately, some of the mussels were just too strong and overwhelming. Texture-wise, they could've been a bit crisper and snappier as well. The three large shrimp, cooked to a wonderful, meaty consistency, were delicious, easily good enough to stand on their own. They were joined by a cool, refreshing mint sauce and a salad of cubed watermelon and cucumber. 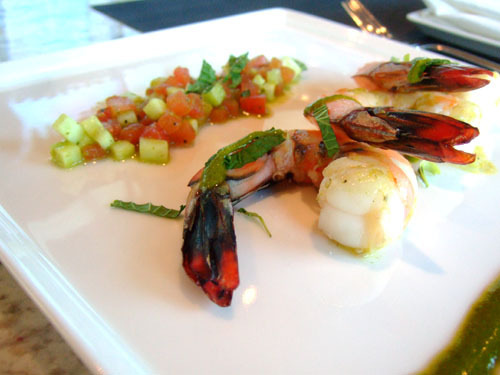 These accoutrements accentuated the shrimp perfectly, drawing out contrasting flavors of sweet and savory in expert fashion. My favorite dish of the meal. Pronounced "schnee-peck," the salsa literally means "dog's snout," as in the salsa being so hot that it'll make your nose run like a dog's. Fortunately, it wasn't that hot, but instead had a sweet/savory/spicy interplay going on, actually reminding me a bit of chipotle salsa. 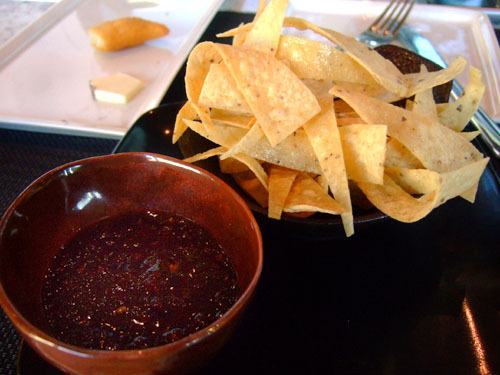 The salsa was served with some too-fragile tortilla chips (whose shape made me think of duck tongue), which I promptly ran out of. I'd about finished the Purple Rain at this point, so I ordered up a Donaji [$14], a cocktail made with Mezcal, Fresh Citrus, Pomegranate, Agave Nectar, and Chapulin Salt. I believe this was my first time having mezcal, a spirit distilled from agave (à la tequila), so I was curious as to how it'd be used in the drink. The fruit was key in mitigating the power of the mezcal, resulting in flavor that was sweet initially, but layered with the woody smokiness of the spirit. 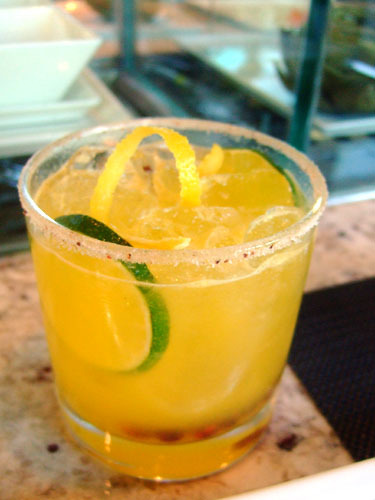 Interestingly, the "Chapulin salt" rim wasn't just salt, but actually salt mixed with finely ground crickets! 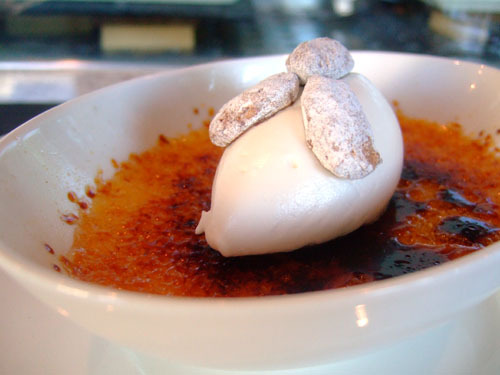 Crema catalana is basically the Catalan version of crème brûlée. Flavor-wise, the custard itself was very similar. What set this apart were the almonds, which added a sweet nuttiness as well as a crunchy texture contrast, and the Xerez (Sherry) cream, which contributed a nice bitterness to counter the sweetness of the custard. Quite nice. You know, despite a few missteps, I did enjoy my lunch at Rivera. I think that Sedler manages to successfully blend his French training (he worked under Jean Bertranou at L'Ermitage after all) with his passion for Latin cuisine, creating an amalgam that seems to work quite well. Before I pass final judgment on the place, I'd really like to return sometime to give the dinner menu a proper work out, but so far, so good. Sorry I couldn't join you for this meal. Maybe next time (with a bit more notice :) Good cocktail choices. I haven't had the Donaji, but the Purple Rain and so many others there, are fantastic. I wonder if I could swing a lunch there sometime soon, it's only a 25 cent busride away. Also, I'd probably say that while pisco is technically a brandy, it resembles eau de vie a lot more. Matt: Ah don't worry about it; it was sort of a spur-of-the-moment lunch anyway. I saw your Rivera post, and do agree that the cocktail program appears to be one of the better ones around. I definitely will be trying more next time I'm there. I had to go back to a meeting after this particular meal, so I didn't want to drink too much! 5 Star: Where did you end up going in London? Hopefully Fat Duck? Ok. I'll make sure to get it with gin next time; I can see how the floral notes of gin would better complement the other ingredients. But if gin works so well, why can't Julian just invent another cocktail that features vodka and leave the gin in Purple Rain? This place looks really great--high-end, creative, and affordable. It's the kind of joint I could take my plebeian parents to without feeling like I'm doing something wrong by spending huge sums of money on "mere" food. Progression of Stuffings for the olives is such a great (and simple) idea. Can't wait to try Rivera. Thanks! Jo: It is a good idea; I'm actually a bit surprised that this is the first time I've seen it. Cute too! Out of curiousity, where do you go if you just want good cocktails? Good question Yena. I rarely want just a good cocktail, without good food to go along with it. 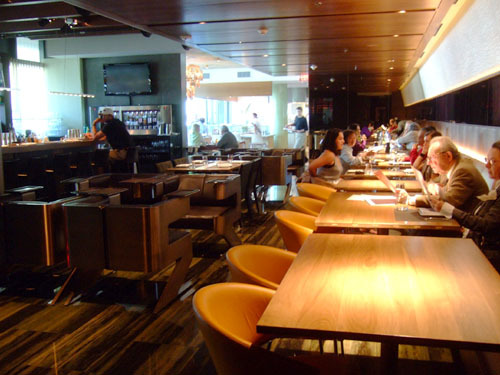 However, in terms of cocktail lounge places, Mattatouille likes "The Varnish, The Association, Seven Grand, or even Cole's." Please tell me if you're ever downtown! I can walk to all these places, man! Will do. Where do you live exactly?